It was a nerve-wrecking robbery attempt caught on CCTV at an ATM at Majra Dabas in Delhi. 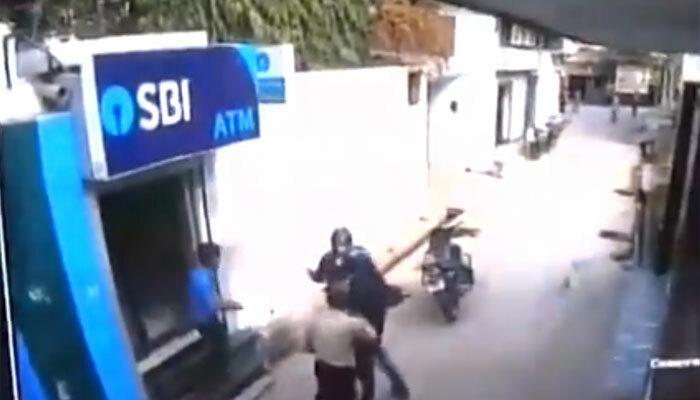 A security guard posted at one of the ATMs of State Bank of India in Delhi foiled an attempt of robbery by an armed goon. The incident, which took place on November 15, 2017. The incident was captured on CCTV camera fixed outside the ATM. In the video, we can see how an ATM guard managed to foil a robbery attempt by two bike-borne criminals despite being shot at. The old ATM guard is a superhero and all the superheroes don’t wear capes. 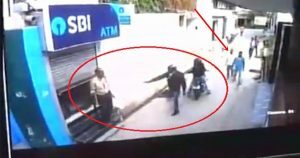 The visuals show two motorcycle-borne men attacking the security guard as he resisted their bid to loot the ATM. The two men then fired shots at him, snatched the guard’s rifle and fled from the spot. The thieves failed to loot the ATM because the ATM guard was strong enough to stop them robbing anything from the ATM. Despite being shot at, the old man blocked the assailant who tried to enter the ATM, caught hold of his gun and pushed him aside. The thief then shot in the air, called for help and his partner could be seen trying to enter the ATM. The middle-aged security guard was badly injured in the incident. The CCTV footage also shows people watching the whole incident from a safe distance and not rushing forward to help the guard. Realizing there is one other man inside the ATM, the criminals try to flee. The guard, still being dragged around by one of the assailants could be seen trying to convince them not to do more harm. The guard was rushed to the hospital, is now out of danger. The Delhi Police have, meanwhile, registered a case against the miscreants under Sections 394/397 of the Indian Penal Code and Sections 25/27 of the Arms Act. Must Read: This 27-Year-Old, Duped People In New Delhi At ATMs Using A Matchstick, Check Out How!